White or red? Now you can choose both. These miniature wine carafes are perfect for dinner parties, wine tasting and celebrations. Each guest can choose their own wine and allow it to aerate to perfection. 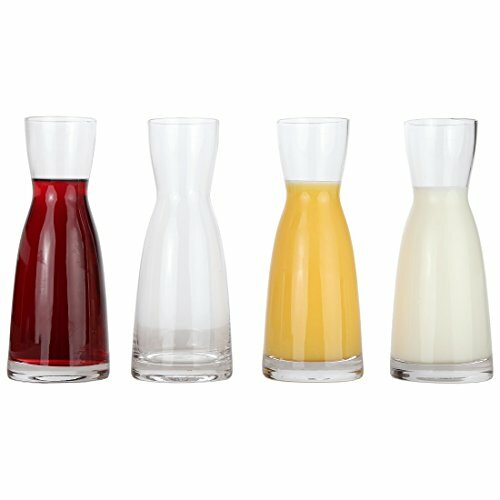 These decanters hold about 10 ounces or a full glass of wine. For best flavor, decant for 30 minutes to two hours. If wine is not your thing, this carafe is also excellent for holding water on your bedside table, or for holding orange juice on your breakfast or brunch setting. Constructed from machine made, lead free glass, these glasses are top-rack dishwasher-safe. Lily's Home offers beautifully designed clocks, dishware, garden decorations, and more to add a touch of style to any home. Whether you're looking for a statement piece for your living room or looking for a way to add more color to your garden, Lily's Home has just what you're looking for! AERATE 4 WINES AT ONCE: Great for wine tasting events and parties. The simple look is bound to provide years of enjoyment at family meals and party functions. Grab a set for parties, or give one to each of your friends. FOR REDS AND WHITES: Aerate all of your favorite wines to release a deeper flavor profile. The personal size glasses are easy to hold and pour and have wide bases for stability on your table, bar, guest bathroom, and more. HOLDS INDIVIDUAL SERVINGS: Each decanter holds about 10 ounces or a full glass of wine. If you don't enjoy wine, these also make excellent water containers for nighttime bedside use, or even for holding a variety of fruit juices at meals. HIGH QUALITY CONSTRUCTION: Machine made lead-free glass that is top-rack dishwasher-safe. Use every time you entertain guests, retains a crystal clear shine. These glasses come in a set of 4 for a wide variety of uses.